The candleholder or the candlestick was originally meant for holding the candle upright and to catch the dripping wax so as to protect the surface where the candle stood. The earliest candleholder discovered is made of clay and dates back to 400 B.C. Wealthier homes used the candelabra both for functional and decorative purposes. Its height and grandeur evolved as silverware became the centerpiece in a dining table. Candlesticks were popular during the Early Elizabethan and Stuart periods. They were made of silver during the 1600s and then by brass in the next era. In the 18th century, the baluster became increasingly popular. The invention of the electric bulb in the 1870s made the candleholder unnecessary but they remain as popular decorative pieces even today. Tea light candle holders are really commonly seen in many houses across North America. These types of candle holders are convenient to use and will also look great with certain types of candles. These are designed to hold small candles and are excellent for providing a bit of mood lighting. If you are trying to create the right atmosphere for a romantic dinner with your sweetheart, then setting up some candles inside of tea light candle holders should do the trick. Another positive aspect of tea light candle holders is that they are very inexpensive. This is going to be one of the most affordable types of candle holders that you can purchase while still having things look really nice. There are a variety of different tea light candle holders to choose from, too. Many of them will look vastly different when compared to one another, but they are fundamentally the same in how they function. You will see certain types of tea light candle holders that look like mason jars. There are people out there that enjoy making their own tea light candle holders in their spare time. It isn’t too tough to do, but you don’t have to dedicate your time to this if you don’t want to. It will be possible to buy beautiful candle holders from a retail store as well. 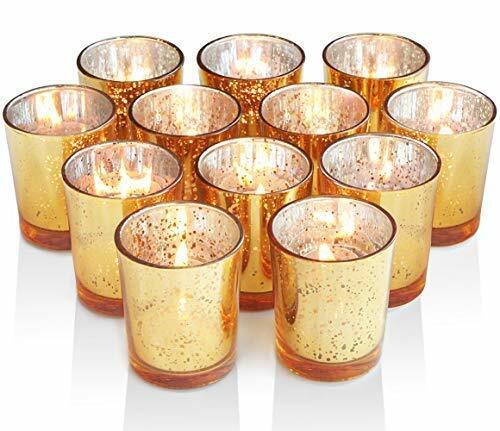 The example tea light candle holder that is being shown off here is golden and will look right at home at a high-end dinner table setting. This is a set of 12 candle holders that you will love making use of. These candles look exquisite but are still very reasonably priced. It is something that will work perfectly for you if you are looking for aesthetically pleasing mood lighting. Candelabras are unique because they are something that dates back to the very distant past. These types of candle holders were used in ancient times and have been a popular design choice for longer than anything else on this list. People were putting candelabras to good use back in the earliest days of history and they are still interesting additions to your décor today. If you want to have a candle holder that is undeniably eye-catching, then this should work out nicely for you. Of course, candelabras are very showy and it can be difficult to incorporate them into certain living spaces. Oftentimes, people will wind up placing a candelabra on top of a dining table as a decorative piece. It can be placed directly in the center of the table to help add some charm to your dining room. The candelabra will be ready to use whenever you want to light a candle and create some mood lighting. There are other types of candelabras on the market, too. Some of them can be quite large and they might wind up being difficult to find space for in your home. There are also candelabras that have modern sensibilities that you can consider. Whatever your needs are, you should be able to find a candelabra that you will fall in love with. This candelabra here is very interesting and its design will appeal to fans of nautical themes. It is designed to look like an octopus with three tentacles stretched out upwards to hold your candles for you. It has a very interesting look that is certainly going to garner some attention if you choose to make use of it. Consider it if you like the overall appeal of this piece. Most modern chandeliers will make use of proper electric lights. In the past, chandeliers were hung from the ceiling and used candles to help light up a room. They are very fancy candle holders that function similarly to a candelabra. Like the candelabra mentioned above, this is going to be capable of holding multiple candles at once. Finding a candle chandelier in modern times isn’t going to be as simple as it once was. People used to have candle chandeliers for very practical reasons. You would see them hanging proudly above royal dining tables and they could be very ornate. There isn’t a lot of practicality to owning a candle chandelier in the current day. In fact, many people would see a candle chandelier as a potential fire hazard and would likely advise against owning one. If you are going to install a candle chandelier in your home, then you will want to be very careful. Ensure that the chandelier is hanging low enough from the ceiling that you won’t have issues with the flames catching anything. You will also want to keep a close eye on the candle chandelier and may not want to leave candles lit while no one is there to supervise things. As long as you take the necessary precautions, using this type of candle holder can be a fun throwback to days that have long since passed. The candle chandelier that is being shown here is very nice. This is a safe model to use that will also provide you with a very intriguing decoration when your candles are not lit. This is something that you will be proud to display in your dining room or elsewhere in your home. It is actually fairly affordable as well, so it is worth your consideration if the idea of a candle chandelier has you intrigued. Lanterns have been used as candle holders for a very long time, too. You might be familiar with oil lanterns that burn brightly to help you light the way during the night. These function similarly except that candles are placed inside to be used as the light source. They can be very nice and many people place them on stands or on hooks as decorative pieces. You will find that there are many types of lanterns that are designed to hold candles. The designs of these lanterns will vary greatly, so it should not be difficult to find one that appeals to your sensibilities. If you make use of this type of candle holder, then it will certainly look really neat in your home. It’s something that can be used comfortably in many areas of the house and it even has the potential to look very upscale. This is a type of candle holder that can be comfortably used outdoors, too. You can enjoy a candlelit camping trip if you so desire. 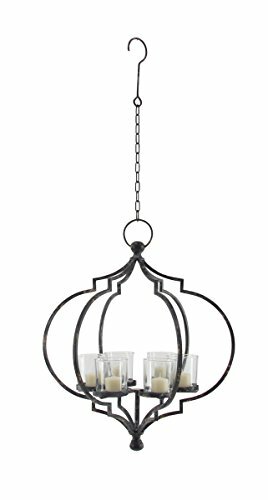 Many people like to put these lantern candle holders out on their patio area to help provide some mood lighting during the evening and night. They are versatile in many ways and this is going to be a good purchase for you if you are in need. The lanterns that are being shown off here will definitely be pleasing to the eyes. This is a stand that comes with three different lanterns. The lanterns are made out of metal and glass so they look as beautiful as possible. This piece will work great as a decoration and it will also be very practical for providing some soft and warm light for any room. 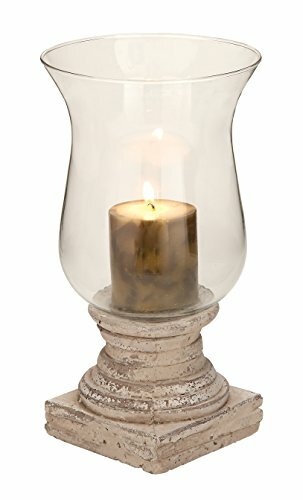 Hurricane lamps have the potential to be among the prettiest candle holders that you can purchase. There are many beautiful hurricane lamps out there and you will definitely find many that will pique your interest. These are named hurricane lamps because they are tall enough to protect the candle inside from the wind. This keeps the candle from being snuffed out so easily and it makes these practical to use outside. There are many people who make use of hurricane lamps both indoors and outdoors. These candle holders will look right at home outside on your patio. It will also look perfectly natural inside when placed on top of a bookshelf or a table. It’s a good candle holder that will provide exactly what you need. It should also be noted that fatter candles will generally fit well in these hurricane lamps. The vases that contain the candles are usually quite large and you won’t have to stick to using skinnier candles. People who like to burn larger candles will really enjoy hurricane lamps because of this. The size is perfect for many different candles and the hurricane lamp itself looks really nice, too. The hurricane lamp that is being used as an example here is really great. It is a ceramic and glass hurricane lamp that has a lot of rustic charm. This is likely going to be the perfect choice to place outdoors near your patio area. It could work well in many other settings too, though. Taper candle holders are actually among the most common types of candle holders that people use in modern times. These types of candle holders will often be used at restaurants and at home as part of a dinner setting. It can help to provide mood lighting and will also simply look nice while people are enjoying their dinner. 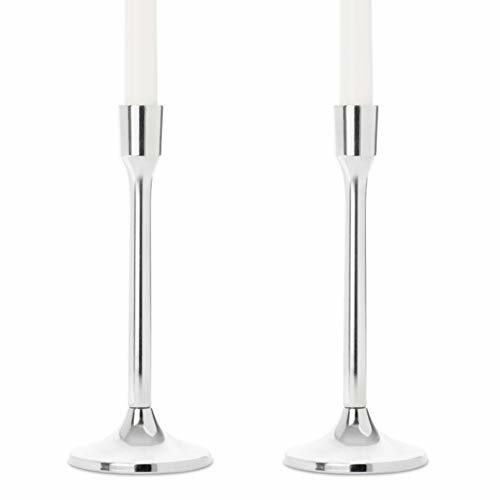 Tapered candles are very common and these holders are designed to hold them in place perfectly. Tapered candles are the skinny candles that you see being sold at most retail stores these days. They will be able to fit in your taper candle holder without feeling wobbly at all. It shouldn’t be able to wriggle inside of the tapered candle holder, so it will be a good tight fit. This will make it very practical to use the candle for dinner settings and picking the holder up to move it won’t make the candle fall out. As you would expect, there are many different kinds of taper candle holders available for purchase. You will find many amazing styles to choose from and it will be simple to find one that fits with the rest of your décor. Whether you are going for a traditional decoration style or if you are looking for something more modern, you will find a taper candle holder that appeals to you. Just take the time to look through the litany of different options that are available to you and everything will turn out great. The taper candle holders that are being shown here will work fantastically for any wedding reception. They have a subtle elegance to them that works well at a formal setting. These stand at nine inches in height, but they are also available in an 11-inch variant if you would prefer that. It’s a good candle holder that will also be very cost effective. Votive candle holders are meant to hold the short candles that are known as votive candles. These types of candle holders are going to be a bit shorter than the tapered holders mentioned above. They will wind up looking more similar to many of the tea light candle holders mentioned earlier. Votive candle holders are going to be quite small and will also be very inexpensive, making it fun to collect different styles. A typical votive candle is only going to be about two inches in height, so you can see how small a votive candle holder is going to need to be. This is going to be a nice candle type to use when you want to make some interesting decorations. Many people decide to use many votive candle holders and place them all together on a shelf or a table. The generally inexpensive nature of these votive candle holders makes it easier to buy multiples of these. There are all sorts of possibilities that you can explore when it comes to setting them up. Some people set all of their votive candle holders up in a row and other people may try to make shapes with them. Whatever it is that you want to do, it won’t cost you a lot of money to accomplish it. These votive candle holders here are very nice overall. This is a two-piece set that is made out of metal. There is a snowflake pattern on the side and the light of the candle will glow through these snowflakes. It looks really pretty overall and will please anyone who decides to purchase it.